The Primetime Emmy Awards aren't until next week, but last night, the first round of awards, the Creative Arts Emmys, honored more of the behind the scenes work of various television shows. 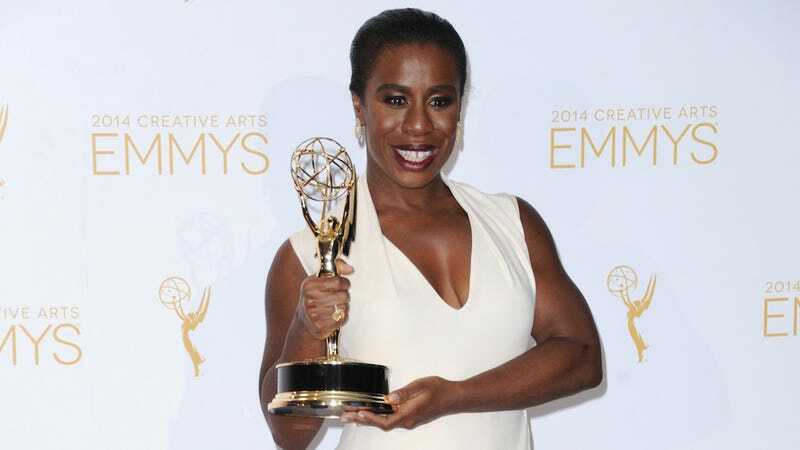 Orange is the New Black won took home awards for editing and casting, and Uzo Aduba took home the Outstanding Guest Actress in a Comedy Series for her work as Crazy Eyes. Other big winners were Saturday Night Live for directing, makeup, hairstyling—Jimmy Fallon won an award for Outstanding Guest Actor in a Comedy Series for hosting SNL. And Bob's Burgers won for Outstanding Animated Program because OF COURSE THEY DID. Also, um, I think the president just won an Emmy? In the category of Outstanding Short-Format Live-Action Entertainment Program, the episode of Between Two Ferns with Zach Galifianakis with Barack Obama took home the statue. So there's that. Here's a crazy long (like insanely long) list of winners to get you pumped for next week's show!